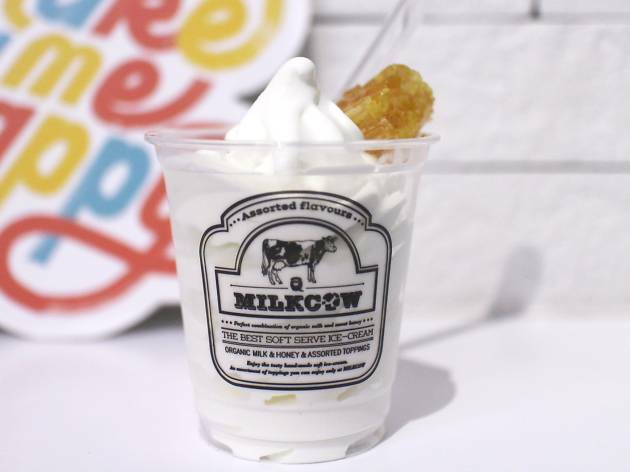 Yet another soft-serve parlour lands on our sunny shores, and this time it's Milkcow from South Korea. The 20-seater shop at The Cathay takes its name very seriously. Not content with a stark black-and-white colour palette in its interiors, Milkcow has splashed cowhide motifs all over its counters. Moo. There are 13 different parfaits ($5.50-$6.50) on the menu, in addition to the basic ice cream-only option ($4.90). Besides obvious choices like Milky Cube ($5.90) with honeycomb, try Milky Peace ($6.50) if you're nutty about pistachio syrup, sunflower seeds, and cashew clusters. For a chocolate fix, Black Pearl ($5.90) comes laced with a thick gianduja syrup and a handful of chocoballs. 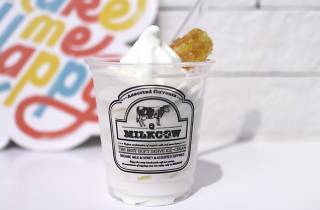 Mind you, the soft-serve at Milkcow is much creamier and richer than what you might be accustomed to.